Once you've decided that you want to get started building your model railroad layout, it may be helpful to develop a project plan for how you should proceed in creating your empire. 1. Decisions - These are the "Givens and Druthers" as explained first by John Allen when he approached the planning for his famous Gorre and Defetid Railroad. We've discussed these basic decisions in some detail on the "Getting Started" Page, including deciding about the theme (or function), era, locale, scale and type of display. Do you want to freelance the railroad or copy a prototype? What kinds of equipment (locomotives and cars) do you want to run? You may want to add your own rules like what you want the height of the layout to be, how wide the aisles should be if you have aisles, and you may want to make sure that all areas of the railroad have easy access, so you're not having to break your back bending over or stand on a ladder or scaffolding to reach the farther sections of your track and scenery. If you are creating this railroad by yourself, you may want to start with a small layout and add to it later gradually. 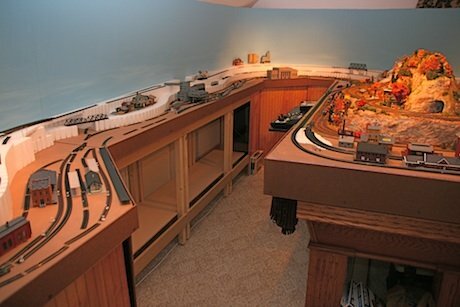 Or, you could plan for a large model railroad layout, but then just build and complete small sections of it at a time. Or, get all the track and trains up and running and then approach the scenery gradually. You have to realize at the outset that if you are planning a large, room-sized layout, and if you still have to earn a living out in the real world, which means you may not have a lot of time to work on it, your model railroad may take a few years to "complete". 2. Layout Design - Once you've answered the above basic questions, then you can begin to design your model railroad layout. Explore the pages on Layout Design 1 and Layout Design 2 to help you with this. 3. Track Planning - Check out the basics of track planning before proceeding. You may want to use a track plan that has already been published, for example in Linn Westcott's book, "101 Track Plans", or you may really want to be original and make your own plan. Always keep the theme and function and ultimately the operation of your railroad in mind as you draw out your plans. 4. Train Room - The model railroad layout room should be a nice place for you to work, including appropriate heating, air conditioning, lighting and the absence of six- or eight-legged critters. 5. Build the Benchwork - There are several different ways to do this. Check out the methods described in the "Benchwork" Page, before deciding how you will do this. Make sure you don't try to build too big of a railroad in too small of a space. Space is good. You need to be able to move around the layout and be able to step back a little so you can appreciate it. Hide the area under the benchwork with a curtain or with sliding panels. 6. Make a Backdrop - This may be as simple as a blue wall in the background, or you may want to paint a mural or buy a backdrop scene. Make sure it is consistent with your theme. Pictures of your layout should not show your workshop or the cluttered storage area under the layout. 7. Draw or loosely lay out your track on the benchwork. Think about where your mountains, rivers, roads and industries will be and mark them on your layout surface. Make cardboard mockups for your future structures. 8. Build the Terrain - Use the techniques described in the "Scenery" section, starting with "Terrain" to learn how to do this. Once you've got the basic terrain in place, you can then start fastening down the roadbed and track. 9. Start Laying Track - Make sure you put easements into the curves, be careful about S-curves, make sure you have enough clearance and radius on your curves to accommodate the longest passenger cars you will be running - especially if 2 passenger trains will be running close to each other on a double track curve. You will need to be thinking about where you will need rail gaps to prevent short circuits for reversing loops and to make isolated blocks if you are going to be wiring for DC. Make sure the track sections are lined up well at the joints to prevent derailments. Test and retest your track after laying each section. Solder rail joints where you need to, but not all of them – especially not turnouts in case you need to replace one. Make sure your turnouts are installed on flat areas only - never on inclines. Test and retest the turnouts to be sure they work properly and don't cause derailments. Use a metal file where needed to smooth ridges that may cause a wheel to jump or hangup. Use a track gauge appropriate for your scale to be sure the rails are the right distance apart in all areas. If you are going to use uncoupling devices, you should know where they will be needed as you put down your track, so you can install them as you go. 10. Wiring - Attach feeder wires to the bottoms or to the outside of the rails about every 3 feet, although many people say every 6 or 10 feet probably works just as well as long as the rail-joints are tight. Decide whether you are going to use DC or DCC power and wire accordingly. Wiring remote turnouts for your model railroad layout can be a daunting and tedious task, not because it's difficult but because there may be a lot of them to do on a large layout. Make a control panel that you will be proud of and that is organized well enough that running your trains will be easy. Take your time on this. If you can't operate your railroad well, you won't be happy with it. 11. Scenery - Now you're ready to add the scenery. This is what makes your model railroad layout realistic. Running trains through forests, valleys, over river trestles and across mountains, through cities, plains, farmland and other types of landscapes is really what makes your railroad come alive. It's definitely part of the "awesome" factor of any model railroad. You can do a little at a time in the beginning, just to give a flavor of the basic scenery and then come back and finish it in greater detail later as you have time. Don't forget to add roads. Create little mini-scenes in different sections of your layout to make things interesting. Add a little humor to your scenes when you can. 12. Add structures as you have time. Building and painting model kits are sometimes time consuming but very rewarding if you take your time and do them right. If you have a need for a building for which there is no kit, you may want to consider kitbashing or scratchbuilding your model. Make sure the structures you have chosen are appropriate for the era, locale and theme. Pick your industries so that they make sense for the railroad in transporting goods from one place to another. 13. Get your trains running and keep them ready to run at any time. Once friends and family know that you have a model railroad layout, they will surely want to see it. That always includes running the trains. If they don't run, the railroad is a failure, no matter how much work you've put into it. Clean your tracks frequently. Keep your turnouts operating well. 14. Invite friends over for operating sessions. Start small perhaps with just one other person. Get used to the techniques and routines of operation specific for your model railroad layout. Then gradually add more operators as you need them. 15. There will always be glitches and problems that require troubleshooting. Don't get too upset by them. It's the nature of the beast, so to speak. It's part of the fun to fix those problems as they occur. If you have a little patience and like to tinker and fix things, you will have fun with this. 16. There are literally hundreds if not thousands of little details that can be added to a model railroad layout that is mostly "finished". Add sound effects, special lighting effects, fires, automated train stops and starts, more people, more trees, etc. Add weathering effects to your trains and buildings. You may decide to change a whole section later. Or you may even want to start over in a different scale and a whole new era. This hobby is all-encompassing and never-ending. Thank goodness! The above should serve as a summary and a guide that you can use for planning your model railroad layout. The details of all of these steps are provided on other pages on this website. Follow the links that will take you to the more detailed pages. Don’t be afraid to experiment or do things a little differently. Maybe you’ll discover something that other model railroaders haven’t thought of before, or maybe you’ll find a new or more efficient way of doing things. If so please let us know so we can pass it along. All you have to do now is get started and have some fun!